I have a customer that is unable to get their L-90K to power on. They are plugging it into their wall socket and it won't power on, the on/off switch on the side will not stay in the power on position. I have asked them to send me pictures of their socket and asked them to check the voltage on the socket. Is there anything else that might cause this? I was actually talking about front panel with my manager last night. I hadn't thought of that when I was talking to the customer, I'd be willing to bet thats what it is. Assuming that the circuit breaker for that outlet is turned on and the voltage is actually 208 volts if that's what the auto transformer was set up for. There is an interlock switch behind the front cover so if the front cover is not securely attached it will not allow power to be turned on. Is this a new/old centrifuge that was moved from somewhere else that may have caused the switch to come loose? It is held in place with two screws that have been known to come loose under the vibrations that can occur while moving it around. This interlock switch is directly connected to the main circuit breaker so that's why it kee3ps the power from engaging. The other issue could be the circuit breaker itself. I replaced more than a few of them that had developed an issue where if you just slowly raised the power switch to the ON position there would be one part of the motion where it would power up but if you moved it anyway at all beyond that point would cause the power to trip. Hope this helps. Unmatched Versatility, reliability, and safety. 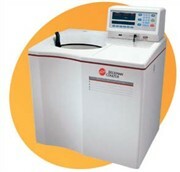 Capable of generating 694,000 x g at speeds up to 90,000 rpm, the Optima L-90 K Ultracentrifuge enables you to perform more separations in less time. This versatile floor model operates with a broad range of superb rotors, including zonal and continuous flow for large-volume separations. The L-90 K offers the reliability of a vacuum-encased induction drive, the simplicity of user-friendly, microprocessor-based control, and environmentally-friendly cooling systems that eliminate the need for CFCs and other harmful liquid refrigerants. All this makes the L-90 K the right choice for your laboratory’s routine separation needs.